I posted the following comment to Peter Hitchens’ blog, this morning. As of now, a few hour later, it is still in moderation. Is it perhaps not politically correct, or perhaps inconvenient? Peter Hitchens needs to be commended for bringing the issue of fatherlessness closer to the realm of the mainstream media. It is high time that that be done, because the escalating consequences of fatherlessness have been with us for decades. Many of the commenters have obviously no problem with fatherlessness. Their stance appears to be: it exists, for good reasons, don’t bother solving it, live with it. Moreover, relatively little emphasis is given to who is to be blamed, other than to show a general consensus that, if fathers are absent in “families,” then it is the fault of men. Those attitudes pose very serious problems, because we truly need to adapt to fatherlessness, as it most likely will be with us for perhaps 800 years or more. We need to reconstruct our civilization out of the ruins and rubble left after its foundation, the traditional nuclear family that had made it the best we had managed to produce, became systematically deconstructed during the last 130 years or so, ever since big government took on the job of protector and provider for women and “their” children. To reconstruct a civilization more or less from scratch, without inter-generational transfer of social traditions and and experiences, indeed, without family traditions and the wealth of families, is a massive job. It took ten-thousand years to do it the last time we engaged on that enterprise. It is families and fathers within families who are the building blocks of a functioning, productive and thriving civilization. Families without fathers and fathers without families remove much of the distinction between humans and other mammals. Animals do not have civilizations. Fatherhood is not ‘dying out’. It is being pushed to extinction. They will get what they want and blame the men for the results. “They”? Did men not have a part in what has happened? Men were just passive bystanders and victims? Certainly, we can all agree (and many men do that quite eagerly) that men are being unjustly blamed for the escalating problem of fatherlessness. Still, even many of the men who commented at Peter Hitchens’ article appear to feel that men are to be blamed. Could they be at least partially right? It should not surprise anyone if that were so, because men and women have attended the same intensive indoctrination by a shared education system and its extension, the mainstream media — cradle-to-grave indoctrination of a captive audience (voluntarily captive once they reach maturity). Perhaps many will still maintain that men are without fault in all of that, or at least not as much as women or the social engineers who rule us. Still, once upon a time (not all that long ago) men were leaders in the process of social evolution. It can be argued that they abdicated from their exalted position, while others will assert that men were toppled from it — and “Good riddance,” to boot. What difference does it make? The results are the same. Still, if you wish to absolve men, then consider whether men are truly without blame. Look at this graph: https://fathersforlife.org/images/trends_ffbsh.jpg (from the set of graphs identified in this link). Social engineers can perhaps be blamed for men’s lack of interest in fatherhood, but it was men who swallowed the bait, hook, line and sinker. It is men and women whose interest in fatherhood ranks zero, compared to the levels of interest in the most popular sports. 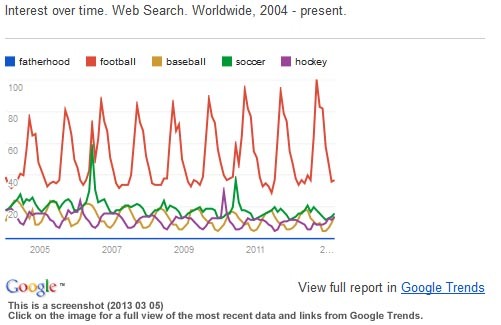 For men, sports are more, many times more important than fatherhood. Regardless of who is to be blamed for that, it is a problem that all of us, men and women, need to deal with. We’ve got to find solutions and must not become preoccupied with assigning blame. We are all in the same boat. The boat has a leak that is causing it to sink. We don’t have enough time to argue over who is to blame. This entry was posted in Family, Social-Destruction Enterprise and tagged Fatherlessness. Bookmark the permalink.